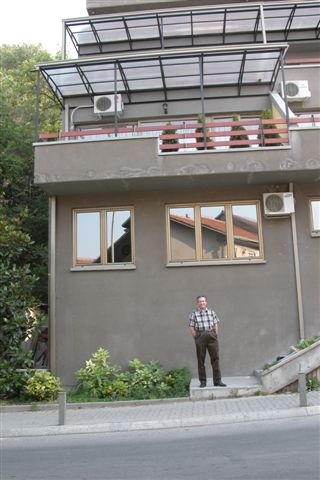 Carole writes, "This is a picture of Ken in front of our apartment in Skopje, the capital of Macedonia. We live on the 2nd floor, corner apartment just above Ken's head. We're on a fairly busy road about 5-7 miles (I'd guess) from town center. Ken has a company car now, but any time I want to go someplace I can catch a cab about three doors down. Otherwise we do have an embassy-approved driver, Tony, available to us. He is Macedonian but speaks English really well and has been so helpful in communicating."